This weekend is Eggiversary here–one year since the Green Egg arrived! To celebrate, we are cooking delicious foods. Last night was Thai-Style Grilled Chicken. We used Milk Street’s Chiang Mai Chicken recipe for the marinade together with Serious Eats Thai-Style Sweet Chili Dipping Sauce. There were a couple minor modifications to the dipping sauce. We substituted serrano peppers as there were no red Thai bird chilies available, and we reduced the sugar to 1/4 cup. Do not over marinate this one, 1 1/2 hours was great, more than 2 hours would be overpowering. The last time we cooked this, it was directly over the coals. 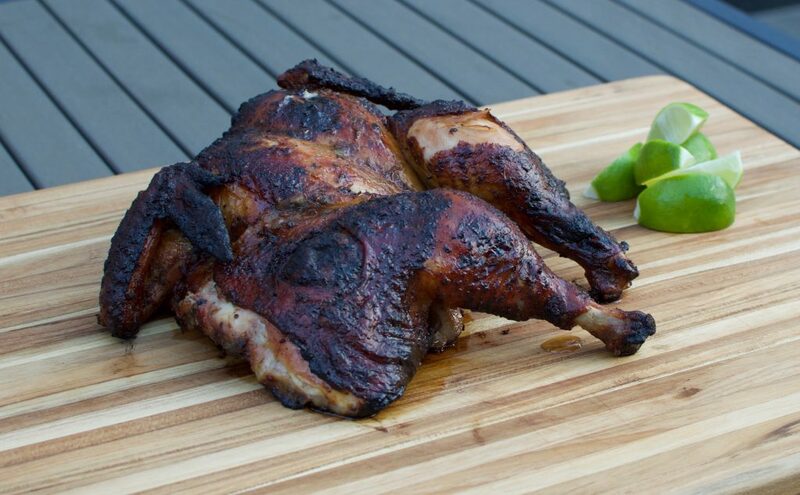 The skin side was cooked for about 15 minutes, then the bird was flipped and cooked until done. This time, we decided to cook it the more (traditional?) way with indirect heat. It was skin side up, indirect at a temperature of between 425º and 450º. Initially the legs were closer to the hot spot, but I turned it around towards the end since the breasts needed a bit more cooking. Notes for next time: Use the same indirect cooking method, but keep the temperature closer to 400º, especially if it’s a larger bird. This should give it some more time to cook through without over-browning the skin.